He was an old man, 28 to be exact, when we first found him. The black mustang with a broad white stripe down his nose had ambled through the paddocks and gummed his hay for almost ten years at the rescue. Although his sway backed apperience deemed him a pasture pal, it was his crow hopping antics that landed him on the unrideable list. Neither of this deterred my mothers love for the dark and handsome animal. So when the day came to take Cash and Zena home for the first time, we loaded Bozley right in behind them. We knew that Bozley had a limited number of years under saddle left to him but he wasn't ready for retirement just yet. He still had he most important job any horse could have, to teach a little boy how to ride. His easy going nature and smooth gait made him the ultimate teacher, but his lessons were hard learned. One afternoon we were out on trail, my nephew Taryn had just become comfortable riding off lead, and Bozley spooked. Taryn flopped in the saddle, his horse gave a little buck, and the boy somersaulted through the air landing on the ground in a belly flop. Taryn didn't move and Bozley stood there staring at him, both a little stunned at the event. I jumped off my own horse and scooped him up in my arms. After a good long hug I asked him, "What do cowboys do when they get thrown from their horse?" He replied through big boy tears, "Get back on." He wiped the dirt from his face, petted Bozley's nose making them both feel a bit better, and got back on. The old man is the barn favorite, even our stable manager Karl dotes on him. Although his sides have started to grey and his hay is served as a soaked mush, the geriatric horse still nips and plays with the other geldings. So as the old adage goes, "You are only as old as you feel." The first time I saw the lanky bay thoroughbred he was in quarantine. A large abscess clung under his jaw with all of the signs of strangles. I didn't dare touch him, in fear of spreading the infection to the rest of the horses, but his kind eyes pleaded to be acknowledge. I was a new volunteer at the rescue ranch, mucking paddocks and grooming elderly horses. Each job there has it's merit but I wanted to ride, and I wanted to ride the bay. When he was released from quarantine, the threat of strangles begnin, I doted upon him like a little girl with her first pony. It had been over five years since I had lost my own mare to colic, his horsy smell soothed my wounded heart. Our trust grew over grooming sessions and long walks and so did my confidence. I was ready to ride. Yet, my stomach fluttered as I took him to the round pen for the first time. 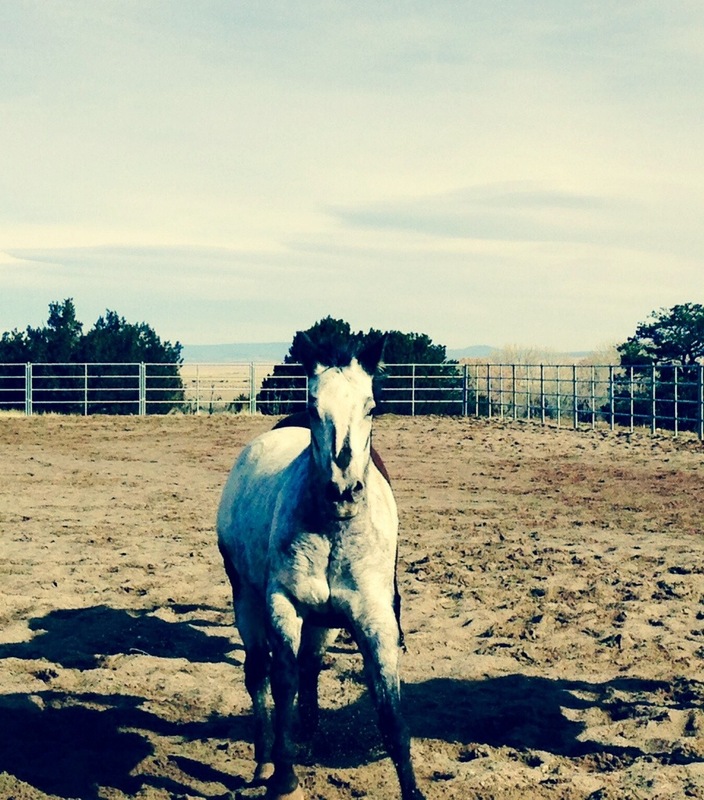 My basic horsemanship skills were returning, but I knew nothing about rescue horses. Would all that my mother so patiently taught me about horses relate to this forgotten animal? Cash looked at me from the end of the lunge line, I cued him to move, and he shot off running laps around me. Apparently he thought himself to be quiet the racehorse. After a big breath I finally slowed him down and he began to move, settling into the most beautiful hobby horse gait. My heart leapt, I couldn't wait to be on his back. Months passed as Cash and I worked. I still didn't know exactly what I was doing, but I knew I had to gain his trust on the ground before he trusted me on his back. When the day came to ask for his sponsorship, I still hadn't ridden him, let alone any horse at the ranch. I know many people were concerned that I had chosen the big skittish gelding as my maiden rescue horse ride. An audience appeared leaning on the fences like gawkers at an old fashioned rodeo. I was no longer nervous when I lead the saddled up bay into the round pen. I trusted him, and I was hoping like heck he trusted me. His ears twitched a bit, picking up on the crowds tension. With one foot in the sturrup, I swung up easily. Visions of our first encounter in the round pen flashed throug my mind as I picked up the reigns and urged him on. He walked out in a gental stride. Ok, so far so good, let try him at a trot. I slid my hands down the reign and I could feel him tense beneath me. Moving him forward he thrust up his head and roughly trotted about the circle. Seeing this shift my audience began to offer words of advise. "Disengage his rear end," or "Work the circle to slow him." I'm sure they were all waiting for a bucking bronc performance, but I didn't have a clue what they were trying to tell me. Instead I did just as my mother always taught me, relax and ride the horse. I dropped my hands a bit, relaxed my seat and trusted this horse. He must have felt that change because he trusted me too and relaxed. It was beautiful.